St Paul's Year 9 won the division 2 of the All Ireland Feile which was captained by a past student of Our Lady of Grace - Gavin Kantsa. During his acceptance speech in a 40,000 seater stadium he paid tribute to his late mother and to his primary school where he was introduced to the Sport of Gaelic Football. 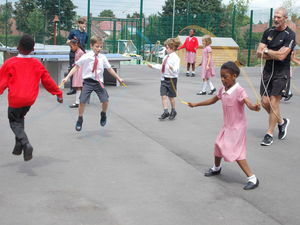 “Skippy John” from “Skipping 4 Life” spent the day working with all year groups to teach various skipping skills. 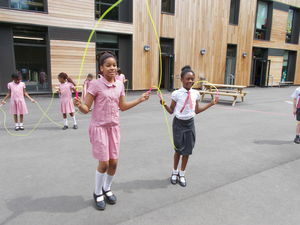 Skipping 4 Life’s aim is to encourage children and adults to skip for health, fun and fitness, whilst promoting modern and traditional skipping games, including Individual Skills, Partner Skipping, Double Dutch & Long Rope Team Games. 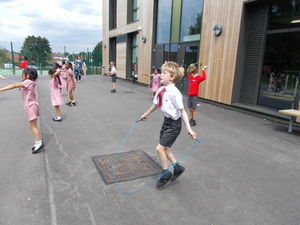 The children had a great time and learnt some really fun ways to skip. 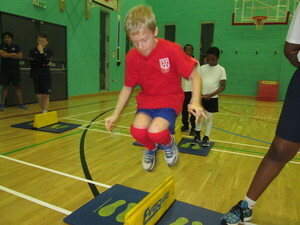 Congratulations to all those children who took part in the Greenwich Annual Swimming Gala at The Eltham Centre. We came 3rd overall and 2nd in the small schools category. Well done team! 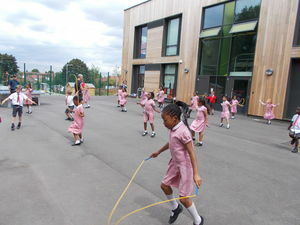 On Thursday 22nd June, Year 4 participated in Sportathon at Sutcliffe Park.They took part in a range of activities including athletics, wheelchair racing, ball skills and the big dance. It was fantastic how the class worked as a team and co-operated with each other. The boys and girls were so proud to come 2nd in the event against 16 other schools - a terrific result! Girls from Years 5 & 6 went to St Paul's Academy for an afternoon of Gaelic Football. The girls played 5 games against local Primary Schools and the day ended with 3 wins and 2 defeats. 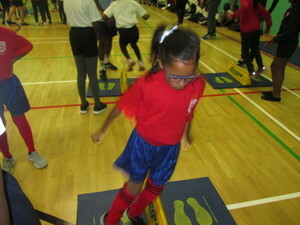 We saw some great skills and determination from all the girls. Well done! The boys from Year 5 & 6 went to St Paul's Academy to play Gaelic Football where they played 3 games ending with 2 wins and 1 defeat. On a very hot sunny day the boys performed very well in all the games with great attitude. Well done boys! Our Lady of Grace played 3 games against De Lucy, St Patrick's and Kidbrooke Primary Schools winning all 3 in convincing style. That put the team into the final with St Peter's which brought out some fantastic rugby by both teams and after extra time, the two teams stayed level on one goal a piece which meant both schools shared the winning trophy. Well done to all involved! 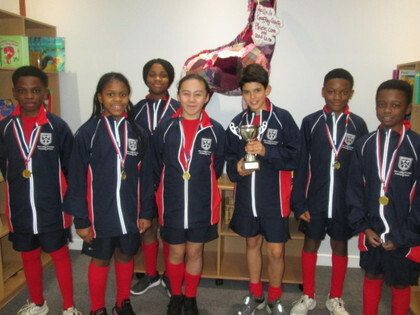 Our Lady of Grace took part in the Football Tournament at St Paul's Academy and enjoyed some great performances against 3 local schools, that took them to the final. They showed great team effort, just losing the final against St Mary's 4-2. Well done boys. 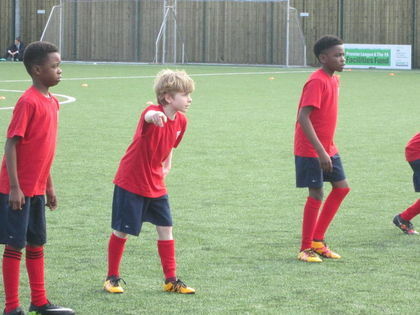 Jack, Year 6 - On Tuesday 7th February, I took part in a football tournament. I was really nervous on the minibus but when we started I wasn't. We won all our games except the finals which we lost 4-2. 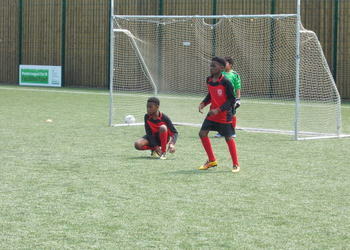 My favourite match was against St Peter's where we won 4-1. I scored from 25 metres out and hit the crossbar then the ball went in. It wasn't nice to lose the final but the other team played better. We all returned to school with big smiles as we were all happy we came second. What another fantastic win by our Basketball team, beating 7 other schools to 1st place! Well done children, we are very proud of you. 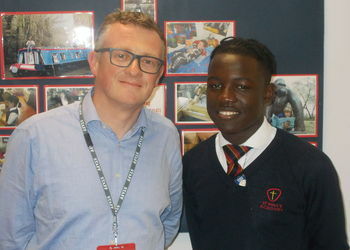 Michael Maher, St Paul's Academy - Our Lady of Grace are at it again! They performed with superb effort levels and a wonderful team attitude. Diogo, Year 6 - When we arrived at St Paul's all our hearts thudded in our throats. It was our first tournament of the year and all of the teams looked strong and competitive, but I knew if we tried our best we could win this tournament. Our first match was against a local team and who we beat easily. Our second game was against St Mary's who played well and their shooting was very good - we equalized this them. Another easy third match which put us into the semi-final. We played against St Thomas-a-Beckett. They were strong and tall and it was a very hard game but we managed to win it. Our final game was against St Mary's - it was very tight at the beginning but both teams passed and moved well. St Mary's scored but our heads didn't drop - we carried on fighting and then we got the equalizer. 5 minutes before the final whistle we scored again - St Mary's heads dropped a little and we took advantage of that. In the final minute we scored again - quick, clever passing followed by teamwork and encouragement - WE WON! What a great start! 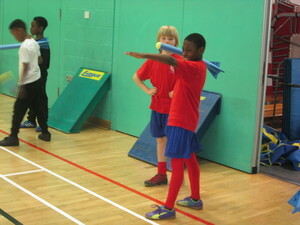 Our Lady of Grace had a great time at the Athletics Tournament at St Paul's against other local Primary Schools. 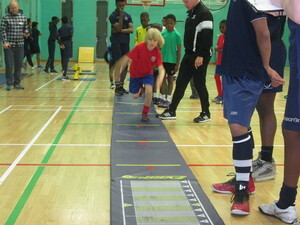 The Year 4 participated with real enthusiasm and team spirit, helping each other achieve some great performances especially in the standing jump, triple jump and speed bounce. It was another good effort from the boys and girls involved. Keep it up!